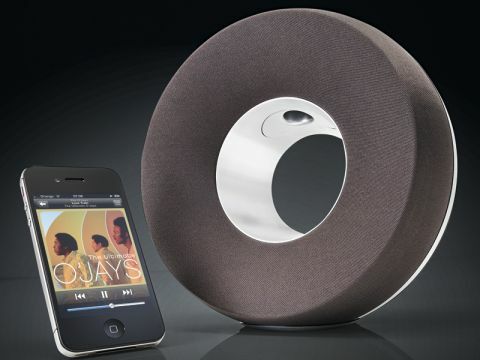 You can always count on Philips to do something striking with the design of its speaker docks, and the doughnut-shaped Fidelio SoundRing DS3800W is no different. Though here the focus is on providing a room-filling sound for smaller spaces rather than the mighty, high-fidelity delivery of its sibling Fidelio SoundSphere. The SoundRing's design comprises two front-firing and two side-firing speakers to give it a larger-than-expected soundstage given the unit's tiny size. You can easily place it on a desk or bedside table without it taking up too much room. Its compact size also makes it easy to carry around for easy listening everywhere, but you'll need to buy the step-up model, the DS3880W, for true portability, as it includes a built-in rechargeable battery. Clad in chocolate-coloured cloth with brushed aluminium highlights, the SoundRing does, however, feature basic playback and power controls on the top, plus a USB port 3.5mm audio input and a Wi-Fi setup button so you can add it to your Wi-Fi network and then stream music to it from your Mac, iPhone, iPod touch or iPad. Setup is straightforward, although you'll need to download the Fidelio app if you're to make the most of its additional features, such as internet radio streaming, music alarms and showing off your music tastes via Facebook and Twitter. When it comes to listening to that music, the SoundRing is a mixed bag. As its size suggests, its perfect for close-quarters listening at modest volumes, with a clear delivery that's enjoyable to listen to. The problems start when you want to listen louder or feed it with driving rock or dance. Unfortunately, the SoundRing is ill-equipped to cope with either, sounding brittle and harsh with plenty of distortion evident when driven hard. None of this is helped by the bass-lite delivery, something not unexpected with a speaker of this size. Accept its limitations and the SoundRing just about passes muster.